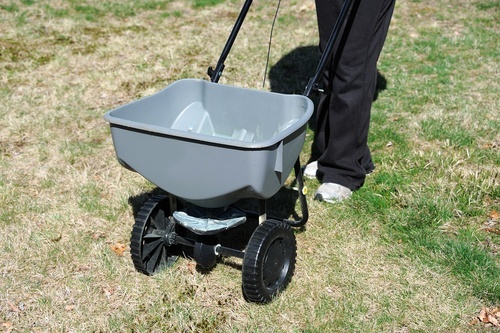 One secret to keeping your lawn healthy and green is fertilizing — especially in the springtime. There are several reasons why you should research lawn fertilizing. Even if you choose not to do it yourself, it’s wise to understand what fertilizer is and the benefits of using it. You can achieve healthy turf by developing a program for lawn fertilizing or by working with a landscape professional who can customize a treatment plan for your yard. When to fertilize and how often are equally important facts to know for the health of your lawn. Organic fertilization is an option if living green and sustainability are important to you. If you feel uncomfortable about treating your lawn with fertilizer yourself, you should seek the help of your local qualified landscape professional. Weed growth is limited when you use fertilizer. If your grass is thick and healthy, it will naturally inhibit weed growth. If you have installed new turf, part of the responsibility of maintaining it and making sure it thrives is to use fertilizer. A tidy yard. When root growth is thick due to healthy grass, your yard has less of a chance of developing muddy puddles. During your lawn’s active growth period, you should apply lawn fertilizing about once every six to eight weeks. If you are applying fertilizer yourself, then divide the yearly amount of fertilizer needed by the number of applications you plan to do (usually two will be in the spring, and two or three in the late summer to fall.) This will result in lush lawn growth. If you want to reduce the number of times you need to mow, then you should only fertilize once in the spring and once in the fall. If you decide to have a landscape professional take care of your turf, consult with them about the lawn fertilization program that is right for you and your yard. A professional landscape company that provides the option to go with organic lawn care options will likely analyze your soil and provide you with custom options. A good program will include an approach to the entire system, building your soil health, eliminating pesticides (synthetic), and growing healthy grass through cultural methods. This creates turf that succeeds against weeds and grubs. The benefit to going with an organic option is the elimination of chemical pesticides. This removes the need to have the chemical warning flags in your yard and makes it safe for children and pets to play on the grass. Your lawn care professional should have some certification or training to show you that they are familiar with the scientific methods behind organic lawn care and lawn fertilizing.